Marco Platzner is Professor for Computer Engineering at Paderborn University. Previously, he held research positions at the Computer Engineering and Networks Lab at ETH Zurich, Switzerland, the Computer Systems Lab at Stanford University, USA, the GMD - Research Center for Information Technology (now Fraunhofer IAIS) in Sankt Augustin, Germany, and the Graz University of Technology, Austria. 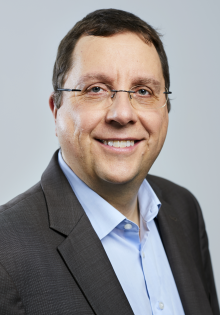 Marco Platzner holds diploma and PhD degrees in Telematics (Graz University of Technology, 1991 and 1996), and a "Habilitation" degree for the area hardware-software codesign (ETH Zurich, 2002). His research interests include reconfigurable computing, hardware-software codesign, and parallel architectures. He currently leads two projects within the Collaborative Research Center (SFB) 901 "On-The-Fly Computing", for which he also serves as deputy speaker. He was coordinator of the EU FP7 FET project EPiCS and contributed to the priority programs SPP 1500 "Dependable Embedded Systems", SPP 1148 "Reconfigurable Computing Systems", and SPP 1183 "Organic Computing" of the German Research Foundation. He is a senior member of the IEEE, a member of the ACM, serves on the program committees of several international conferences (eg. FPL, FPT, FCCM, RAW, DATE), acts regularly as reviewer for scientific journals (eg. IEEE Transactions on Computers, IEEE Transactions on VLSI, ACM Transactions on Embedded Computing Systems), and is an associate editor of the ACM Transactions on Reconfigurable Technology and Systems, the International Journal of Reconfigurable Computing, the EURASIP Journal on Embedded Systems, the Journal of Electrical and Computer Engineering, and the Springer Journal on Design Automation of Embedded Systems. He also serves as a reviewer for several research funding agencies (European Commission, German Research Foundation, German Ministry for Economics and Technology, Dutch Technology Foundation, French Agency for Research Funding, Belgian Research Funding and Innovation Stimulation Agency, Swiss National Science Foundation, Austrian Science Foundation and the Israel Science Foundation). Marco Platzner received a Significant Paper Award from 25 Years of FPL (2015), Best Paper Awards at the ARC International Symposium on Applied Reconfigurable Computing (2018), the IEEE International Conference on Reconfigurable Computing and FPGAs (2015), the International Conference Advances in Computer Games (2015), the Computers and Games Conference (2013), the International Conference on Evolvable Systems (2010), a HiPEAC Publication Award (2009), two Best Paper Awards at the NASA/ESA Conference on Adaptive Hardware and Systems (2008, 2007), and the Weierstraß Prize for excellent teaching from the Faculty for Computer Science, Electrical Engineering and Mathematics of the University of Paderborn (2008). Marco Platzner is member of the boards of the Paderborn Center for Parallel Computing and the Paderborn Institute of Advanced Studies in Computer Science and Engineering. Previously, he was a faculty member of the International Graduate School Dynamic Intelligent Systems of Paderborn University and of the Advanced Learning and Research Institute (ALaRI) at Universita' della Svizzera Italiana (USI), in Lugano. He also served on the board of the Advanced System Engineering Center of Paderborn University and was Head of the Computer Science Department, and Deputy Dean of the Faculty for Computer Science, Electrical Engineering and Mathematics at Paderborn University.